Jujuy, Argentina is a province located in the extreme northwest corner of the country. 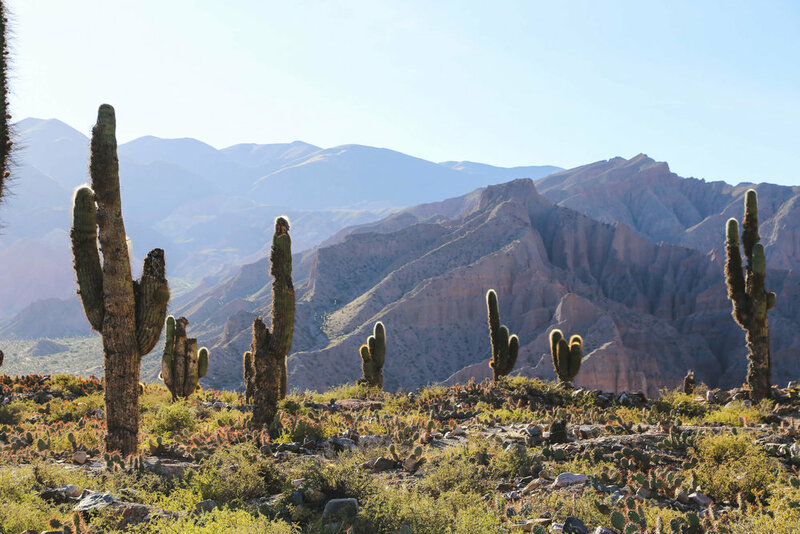 It shares a border with Bolivia and Jujuy's culture and landscape are much more similar to its neighbor than the rest of Argentina. Desert, cactus and dramatic mountains appear at every turn, making this province one of the most stunning areas of the country. But what to do in Jujuy? There isn't as much information available about the northwest compared to the more well-known Patagonia in the south. Here's a breakdown of how we spent three days in Jujuy during our 9-day road trip across the Northwest. 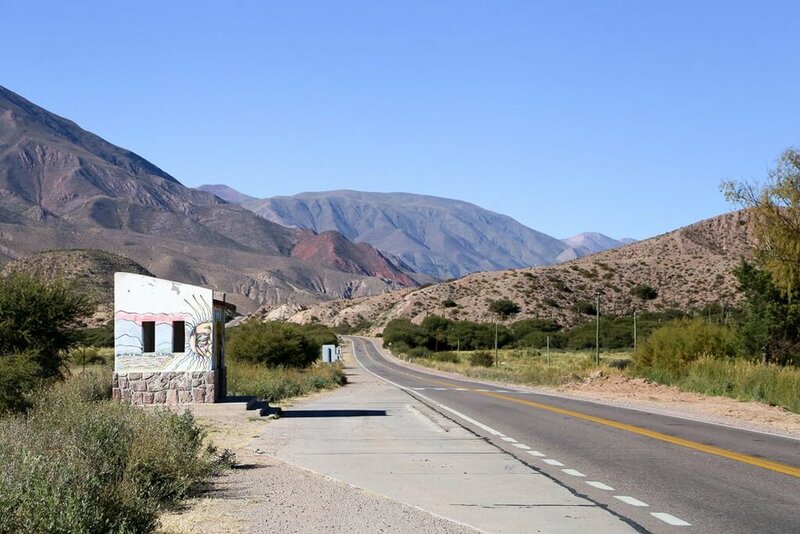 The easiest way to get to Jujuy is by flying from Buenos Aires. You can book a flight directly to the capital, San Salvador de Jujuy. The drive from San Salvador to Tilcara is only an hour and a half. We flew into Salta since we were visiting both provinces, and the drive from Salta to Tilcara took us a little more than three hours. Long distance bus travel is very common in South America. If you're backpacking across South America, it's common to work your way north through Salta, then Jujuy and continue on through Bolivia (or vice versa). But I wouldn't recommend taking a bus from Buenos Aires to Jujuy directly (it takes 23 hours and costs the same as or more than a flight). 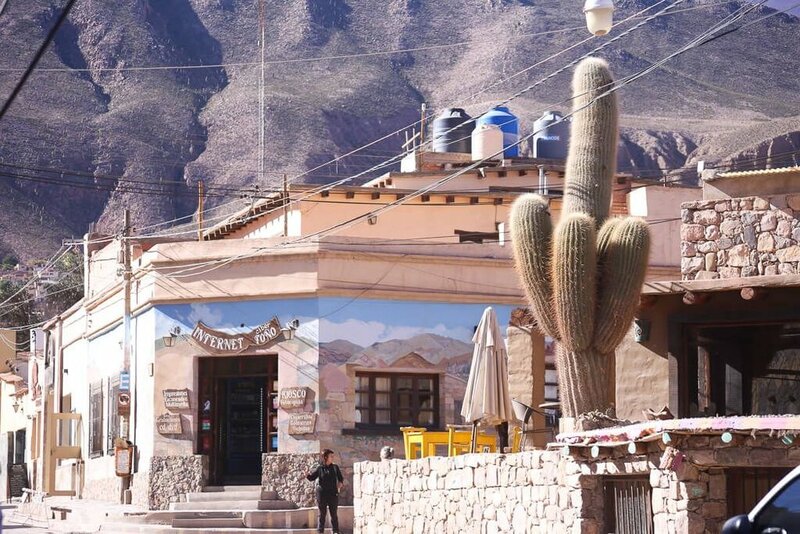 There are a lot of towns to choose from in Jujuy: Purmamarca, Tilcara, and Humahuaca being the three most popular options. I recommend staying in Tilcara. We stayed in an Airbnb but there were a few adorable boutique hotels that caught my eye when walking around town. We stayed in this Airbnb, seen above. The view from that deck was unbeatable. The sunrise each morning made the mountains change colors before our eyes and drinking wine at sunset on the porch was the best thing we did the entire trip. If you're new to Airbnb, click here to get $40 off your first stay. Tilcara has a lot of dining options, and it’s a beautiful town. Of course, it is geared towards tourism (like the rest of the region). But it felt like a lot of locals really lived here, compared to Purmamarca, which felt more like a large tourist market. On our first day, we hit the ground running. Leaving bright and early, we had a full day planned! We spent the day exploring everything there was to see between Tilcara and Humahuaca to the north. After only around twenty of minutes on the road, we were at our first stop: the Tropic of Capricorn. This is a very devout region of the country and there's a large chance you'll see at least one religious procession while you're here. We were lucky enough to see one pass by just as we parked at the Tropic of Capricorn! Very cool. Stop for the photo op with the sundial and peruse the market stalls lining the highway, then continue north. Next stop: the tiny town of Uquia. The highlight in Uquia is the church located on the main square. It was built in 1691 out of adobe and wood from saguaro cactus (cardon cactus). Paintings of armed angels line the walls of the church. These paintings are from the colonial period. Historians say they were used to instill fear in the local indigenous people. The cross and firearms were used to conquer them, both are represented in these paintings. I wasn't allowed to take pictures in the church, but you can see some here. I really wanted to hike and when I heard about this trail, I knew we had to go on this hike in Uquia. If you're facing the church entrance, take the road to your left. Walk uphill, out of town, passing the cemetery. You can drive or walk the kilometer from town to the trail head. It's not well marked, but you'll see a small parking lot and a trail. The trail is marked by red ribbons tied to branches and sticks along the way, but nothing else, so you need to pay attention. The hike to Cerro las Señoritas is easy. It took us between an hour and a half and two hours to walk there and back. It's a steady walk through the desert, so the main challenge is protecting yourself from the strong sun. Bring a hat, plenty of water and wear sunscreen. At right about the point when I didn't think I could handle any more sun, we found ourselves at the entrance of this red canyon. And the best part? We had it to ourselves. We hadn't seen a single soul on this entire trek. Alone, we hiked to the end of this stunning canyon, feeling like we were walking on Mars. We walked until we could walk no further. The canyon reaches a dead end. Perfect spot for a rest and a picnic. Before leaving Uquia, we had picked up a half dozen empanadas for the road. Lunch for two in a canyon? Don't mind if I do! Legend has it that three women from the Incan Empire died in the mountains behind present-day Uquia. They were loaded with gold and fleeing European invaders. When they couldn't run any further, they hid their treasure somewhere in these mountains. Unfortunately, they lost their lives here, but they never gave up their gold. Legend has it that in honor of these three women, three white formations appeared on the red mountains behind Uquia. Despite being full from our empanadas, I wanted to try Cerro La Señorita Resto Bar in Uquia. I'd heard so many good things about this restaurant, referred to as "Lo de Olga" (or Olga's Place), that I couldn't miss the chance. Despite the unassuming adobe brick exterior, inside it's a green oasis. Olga grows her own produce in her backyard garden, so her food is fresh and homemade. If you're hungry after your hike, find Olga's! Right across the highway from the entrance to Uquia, is the town's tourist information. We stopped to use their public bathroom but were pleasantly surprised with what we found. Besides tourist information, the building is also a "cooperativa," selling local crafts and woven goods. We found these coops in every town we visited and I recommend you do your shopping in them. The quality is superior to most of what you'll find in the markets. They sell handmade goods made by local artists (no made in China business here!). The man working here in Uquia was more than happy to show us around. He showed me the difference between the wools of llamas and vicuñas (vicuña wool is so much softer!). 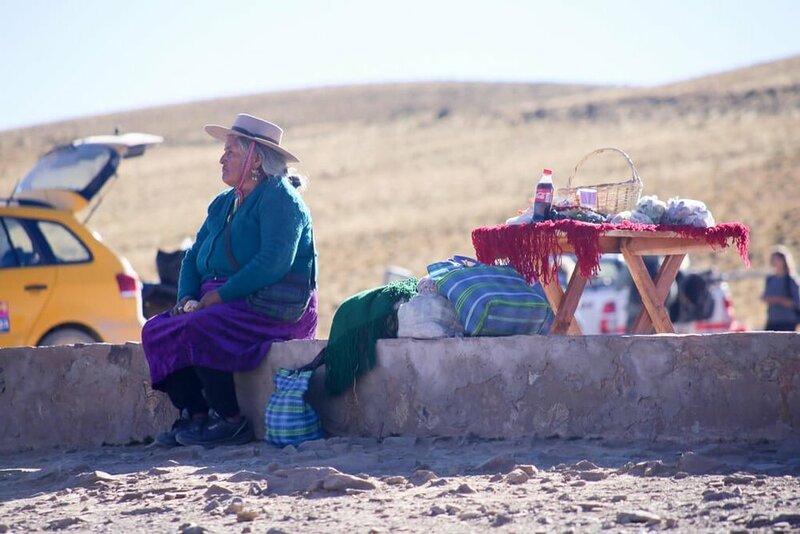 Knowing the cost and work that goes into creating these fibers, it makes sense why 100% llama or vicuña products are so costly (compared to the cheap sweaters you see on tables in the markets). Pro tip: Prices are determined by the weight (as in the amount of fiber involved) of the poncho, blanket or tapestry in question. So sweaters may look the same but one may be much more expensive than the other. You're not being taken advantage of, it just has more wool. Next stop, Humahauca, and its famed 14 Colored Mountain. The drive from Uquia to the viewpoint for the Hornocal took us just under an hour. Take Highway 9 north to Humahuaca. In Humahuaca, follow the signs to the Hornocal, you'll cross a bridge and take an immediate left onto a dirt road. This dirt road takes a long time and involves a lot of hairpin turns and switchbacks, but it's worth every minute on the road. Entrance to the viewpoint (mirador) for the Hornocal costs $50 pesos per vehicle (equivalent to $2 US, at the time of writing). There are toilets at the entrance. I recommend bringing coca leaves to chew on or a thermos of coca tea. The altitude here, at 4,350 meters above sea level, is no joke. The altitude got to me and by the time we were leaving, I felt a bit dizzy and as if my reactions were delayed. And no wonder, we had gained more than 2,000 meters in altitude since we left Tilcara that morning! Caution: Remember that you are at 4,350 meters above sea level. Avoid descending. You could have physical complications due to altitude. You can enjoy the views from the viewpoint area near the parking lot or walk down the trail to get a closer look. If you aren't physically fit, I wouldn't recommend walking down. It looks like an easy stroll, and it is, on the way down. The way up is harder than it looks, mainly due to the effects of the altitude. But it's SO worth it! We ended our first day in Jujuy by exploring Humahuaca. We ended our day a lot later than expected! This was a lot to do in one day. There was about an hour of daylight left (the sunset was at around 8 pm while we were there in May), so we took advantage. is the Heroes of the Independence Monument towers over Humahuaca. The monument pays homage to the Northern Argentine Army that fought in fourteen battles in Humahuaca during Argentina's war for independence. For our second full day in Jujuy, we stayed close to home. The towns of Tilcara, Maimará and Purmamarca are all relatively close to each other. We started the day looking for the Garganta del Diablo, a hike to a beautiful waterfall near Tilcara. We failed to find it because Google Maps sent me on a wild goose chase in the wrong direction. So ideally, I recommend starting your day with this, even though we had to skip it. The pucará ruins in Tilcara were built by the Omaguaca tribe, a pre-Incan civilization. They settled this area in the 12th century and were renowned warriors. This fortress housed 2,000 inhabitants at its peak, occupying 15 acres. In the 15th century, the Incas conquered this pucará and used it as a military outpost. How to visit the Pucará: It's located a kilometer from town, more or less. You can walk or take a taxi. I'm not sure what a taxi would cost, but the taxi up to our Airbnb cost under $2 US, so I can't imagine it's pricey. We had a rental car, so we drove. I loved walking through the ruins of the pucará, looking through the rooms and imagining how people once lived here. The huge pyramid is actually a new addition, built to honor the archeologists who discovered and researched the pucará. Be sure to sit and enjoy the views of the Quebrada (the ravine) before making your way back down. Before you cross the bridge on your way to the pucará, you'll see signs for the Garganta del Diablo. Since we actually ended our day at the pucará, we didn't see these signs while we were looking for the trail. I recommend starting the day with the pucará and this hike. The drive to the trail head takes between 30-45 minutes and is not for the faint of heart. If you don't have a car, you can take a taxi there and walk back. I hear this hike and the waterfalls it leads you to are stunning. Next up, Maimará for wine tasting! This small town is located ten minutes south of Tilcara. You'll know you're there when you see the enormous cemetery built into a mountain overlooking the highway. When I found out about a winery in the region, I had to visit. Vines planted in the valley of this ravine, with cactus intermingling with the grapes? Yes, please. Unfortunately, when we arrived for the tour, we found out that the tour guide didn't show up for work that day. I tried the wine later and can confirm that it is excellent. It seems every town has an iconic mountain, and Maimará is no different. Las Paletas del Pintor is the backdrop to Maimará. You can get a good view from the highway or up close on your way to Bodega Dupont. Purmamarca is one of the most picturesque towns I have ever visited. It's small and it's touristy, and I loved it. If you're looking for souvenirs, you are in the right place. Purmarca is basically one big market. Shop with a discerning eye, because a lot is factory made. But you can find great quality, hand-woven tapestries and ponchos, pottery and just about anything made out of cactus wood. Just like Humahuaca and Maimará, Purmamarca also has its famous mountain. I had a hard time figuring out which one it was. Everything looked so beautiful, which one was supposed to be the standout? There's a viewpoint that cost 10 pesos, it offered a great view of the town and the perfect photo op (above) of the 7 Colored Hill. This was our last day in Jujuy. We were driving south to Cachi from Tilcara and visited the Salt Flats on our way. To get to the Salt Flats, you pass Purmamarca. It's a very common itinerary to combine the Salt Flats and Purmamarca in one day. If you only have 2 days to spend in Jujuy, I'd recommend that as your second day. It's a long drive to the Salt Flats from Tilcara. It took us just under an hour and a half. You cross a mountain pass reaching an altitude of over 4,000 meters above sea level and there are a lot of hairpin turns. It's a paved road, which helps quite a bit (we weren't so lucky later in our trip). Enjoy your visit to the Salt Flats. Take lots of pictures, play with perspective and look for llamas along the way. After our tour of the Salt Flats, we took Ruta 40 south to Cachi, then on to Cafayate, ending our three days in Jujuy. 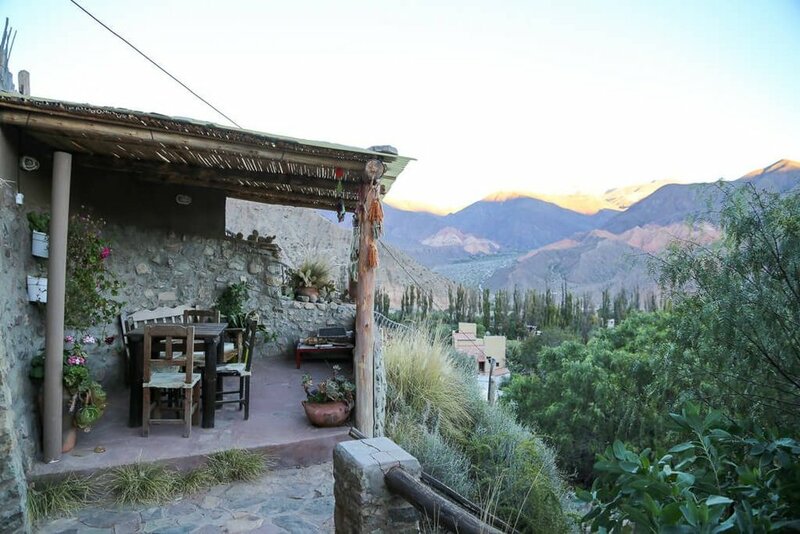 However, if you're staying in Jujuy, consider adding Iruya to this itinerary. It's a village perched in the mountains, north of Humahuaca. Iruya is difficult to get to, so I recommend staying at least 2 nights if you make it there.